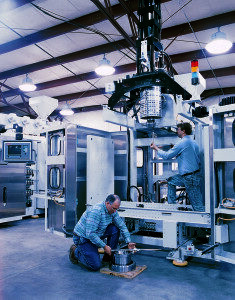 Machinery Development – Custom-Pak, Inc.
Our state-of-the-art Process Engineering and Machinery Development Centers create some of the world’s most technologically advanced blow molding equipment. We build blow molding machines designed specifically to meet your product needs and produce your product as efficiently as possible. If we don’t have it today, we can build it. Our ongoing advances in extrusion blowmolding process engineering, control system design and process research provide you with maximum efficiency without variation. Building capital equipment also allows us to provide better processing equipment at a lower per-unit cost. Whether you require multiple parts, material combinations, special in-press operations or unusual features, we have the experience to build blow molding machinery that will make it happen.